CANNA AQUA is a user-friendly range of products for mind-blowing yields on substrateless (or inert substrate) recirculating systems. With these systems the drainage water doesn't flow away but is reused. One of the big advantages of growing on a recirculating system is that it uses less nutrients and water than most other systems. Also, the plants are in direct contact with the nutrient solution. The yields are high with CANNA AQUA because of a meticulous control of the supply of nutrients during the growth and blooming phase of plants. That's why it's no surprise that in Great Britain – where most growers work with closed hydroponic systems – the majority of the hydro culture growers choose CANNA AQUA nutrients and CANNA Aqua Clay Pebbles. CANNA Aqua Vega is a fast working nutrient for plants, containing all the essential elements for optimal growing. The growth phase is important, because during this phase the plants lay the basis for an exuberant bloom and yield. Aqua Vega is used in recirculating systems, such as NFT or ebb and flow systems. CANNA Aqua Flores is a complete nutrient for plants, containing all the essential elements for optimal flowering. 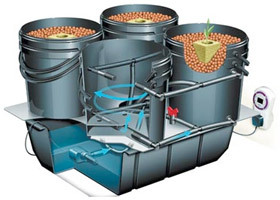 Aqua Flores is used in recirculating systems, such as NFT or ebb and flow systems. 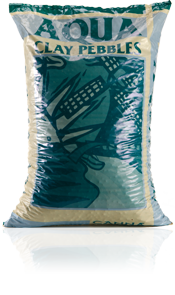 CANNA Aqua Clay Pebbles are baked clay pellets for growing plants in recirculating hydroponic systems. Aqua Clay Pebbles are ideal for growers who want to control the application of nutrients and the humidity level of their plants throughout the entire cultivation process. Hydroponic growers who really want the best of the best choose CANNA AQUA. The CANNA AQUA range of products consists of the CANNA Aqua Vega and Aqua Flores nutrients and CANNA Aqua Clay Pebbles. If there are any air pumps in the nutrient reservoir, remember that these may raise the pH in the nutrient reservoir.